Did you know that a regular electric hot water system can account for up to 30% of your regular electricity bill? That’s right- you could be spending hundreds each quarter just to enjoy good hot showers. However, there is an cost-effective and environmentally friendly alternative – solar hot water systems can help you slash you power bills and still have plenty of hot water to go around. With Australia’s abundant sunshine it makes great sense to get your hot water FREE from the sun. With a Solahart solar water heater you can enjoy big savings on your energy use and reduce your greenhouse gas emissions. Solartech Solutions are proud to be the local Solahart dealer and to perform installations of Solahart solar hot water systems in Rockhampton, Gladstone, Yeppoon, Biloela and Emerald homes as well as properties in surrounding areas. To find out which Solahart solar hot water system is best for you contact us for your FREE home solar assessment. All Solahart roof mounted solar hot water systems use the Thermosiphon principle to collect heat from the sun and transfer it to your hot water. The Thermosiphon principle is based on two naturally occurring phenomena:Dark objects absorb heat and Hot water rises. 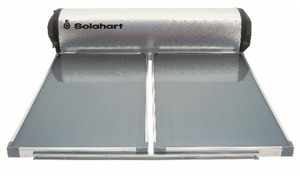 Solahart solar collectors are coated with a dark, heat-absorbent surface. This coating absorbs the energy from the sun’s rays and heats the fluid in the collectors. As the fluid heats, it rises to the top of the collectors and into the tank where it displaces cooler fluid which flows in to the bottom of the collectors where the process is repeated. In open circuit systems the fluid in the collectors is water while in closed circuit systems a special antifreeze fluid, called Hartgard, is used.When heated in the solar collectors, the Hartgard is circulated in a jacket around the tank to transfer the heat to the water inside. Closed circuit systems are recommended for frost prone areas or in situations with poor water chemistry. 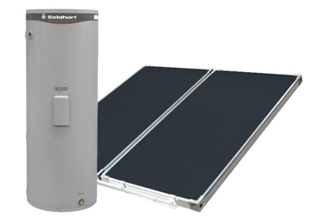 With a Solahart thermosiphon solar hot water heating system you can choose from a range of boosters including in-tank electric or in-line gas boosters to ensure you always have hot water on tap even on cloudy days. 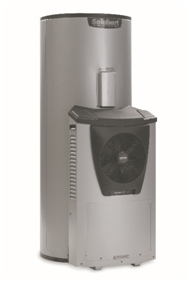 Solahart’s split system solar water heaters are designed to give you the maximum flexibility of installation locations. The low profile and unobtrusive solar collectors are mounted on a roof whilst the storage tank is mounted at ground level out of sight. With open circuit split systems the water is circulated from the tank at ground level through the solar collectors by an electric pump called a ‘circulator’.Cooler water is circulated in a continuous cycle from the bottom of the tank and through the solar collectors where it absorbs the heat extracted from the sun before being returned to the tank.